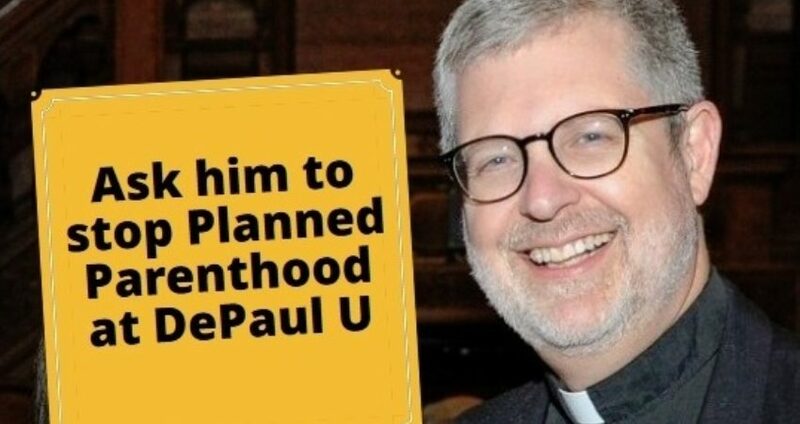 The largest Catholic university in America -- DePaul University -- is offering "clinic volunteering opportunities" with mega abortion provider Planned Parenthood. The university's College of Science and Health and Career Center both encourage students to consider "volunteering" for Planned Parenthood. That means Planned Parenthood is listed twice on DePaul's web site. How can a Catholic university suggest that its students "volunteer" to help Planned Parenthood, the abortion provider that routinely offends God so gravely? Every pro-lifer is invited to sign this urgent petition to Fr. Dennis H. Holtschneider, president of DePaul University, urging him to correct this situation immediately. If you care about the unborn, please sign the peaceful protest now. Ask your friends to help out too. Share this page. Everyone can join. I respectfully urge you to stop offering "clinic volunteering opportunities" with Planned Parenthood at DePaul University. Thank you.